Pecan pie consists of a buttery crust and gooey filling made with pecan nuts and corn syrup custard. Variations of the pie may include other sweeteners such as brown or white sugar, sugar syrup, maple syrup, honey, or molasses. It is sometimes flavored with chocolate or bourbon. This dessert can be topped with a dollop of whipped cream or served with a scoop of vanilla ice cream. This type of pie originated in France. The pecan pie is claimed to have been invented by the French settlers from New Orleans who were introduced to the pecan nut by indigenous population. The first written pecan pie recipe dates back to 1886. The dish was popularized in the 1930s by the manufacturers of Karo corn syrup. 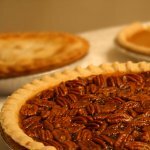 Well-known cookbooks began to include pecan pie in the 1940s. Pecan pies are associated with Thanksgiving and Christmas. But you don't have to wait till Thanksgiving to indulge yourself with a slice of this delicious pie. On National Pecan Pie Day, bake a pie or pick it up at your local bakery. Don't forget to share the pie with your family and friends: sharing is caring!